Designed for use with all Edelbrock carburetors used in Performer or Performer RPM applications. These highperformance Street Fuel Pumps feature a high quality three stage polished finish. The unique valve design improves flow quantity and quality, and will support engines up to 600 hp. High-volume, 3/8” NPT inlet and outlet surpasses the capacity of conventional models. Produces 6 psi and does not require a regulator. For gasoline only. Clockable lower housing can be rotated for best inlet/outlet alignment. 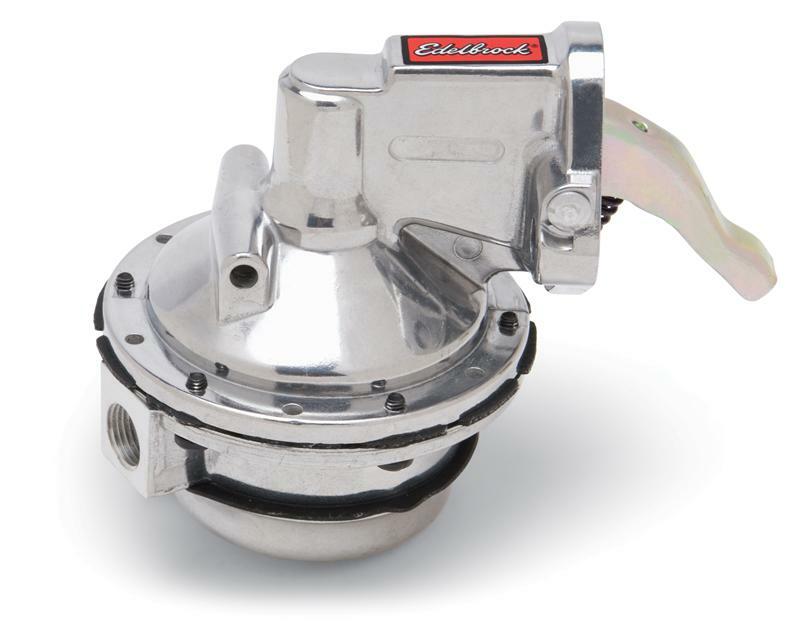 A must for drag racing, circle track racing, street machines or any application that demands a high-volume fuel delivery, these fuel pumps feature a high quality three stage polished finish. High-volume 3/8” NPT inlet and outlet orifices surpass the capacity of conventional models. Produces 10 psi and must be used with an external fuel pressure regulator such as our Fuel Pressure Regulator #8190 or #1727. For gasoline only. Clockable lower housing can be rotated for best inlet/outlet alignment.